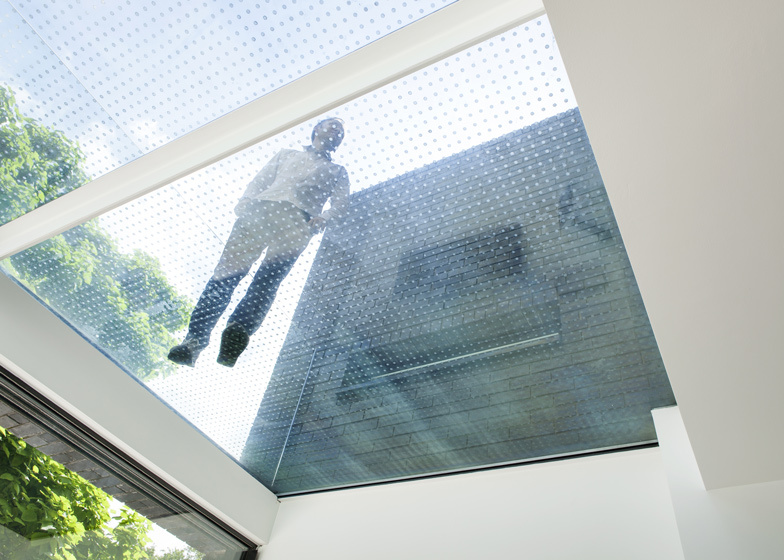 This north London house extension by Lipton Plant Architects features a walk-on glass roof that can be accessed by climbing through a window (+ slideshow). Local studio Lipton Plant Architects added a two-storey extension to the rear of the Victorian townhouse, transforming the kitchen into an open-plan living space and adding a small office and utility room. The architects used blue slate bricks to build the new structure, contrasting against the original brown brickwork of the existing house. 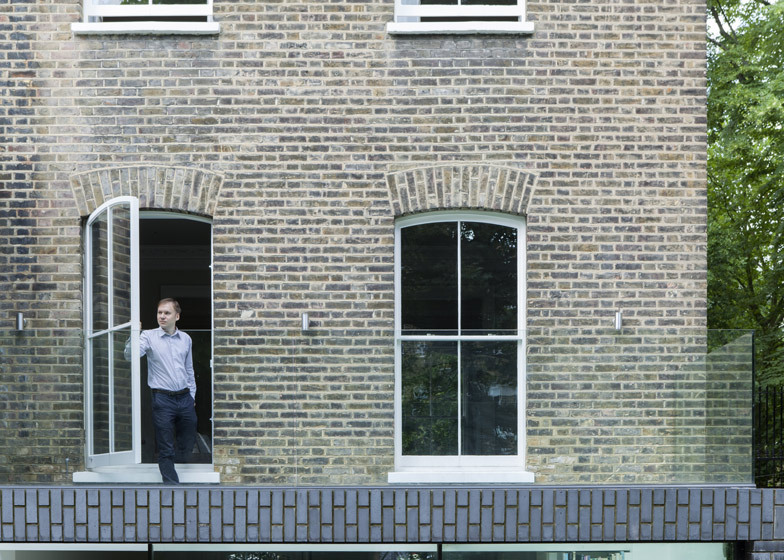 "The extension has provided a wonderfully modern addition to a beautiful Victorian property and through the dark brick and subtle refined detail, has helped maintain much of the original character of this historic Islington building," said Lipton Plant Architects. "We decided to present our client with the blue brick as it was an appropriate material to use in relation to the host building and provided a contrasting natural colour match to the weathered yellow stock," they added. The upper and lower levels are separated into two distinct halves by a band of horizontal brickwork, usually referred to as a soldier course. A small glazed office is positioned above the utility room and can be accessed from the house's main staircase. The roof terrace sits above the living room and can be accessed via a window leading out from one of two existing living rooms. "Providing an abundance of light, the glass roof creates the connection between the upper and ground floor formal living room, and then a less formal dining and lounge space below," said the architects. Other London house extensions we've featured include an addition to a Chelsea townhouse, a narrow studio with a sloping roof, and a space where a wall of books folds around a staircase. Alwyne Place lies within the Canonbury Conservation Area in the heart of Islington, London. The property is a large semi detached, locally listed Victorian villa. The house is of an impressive scale located on a quiet tree-lined street. Our clients fell in love with the building’s proportions and location. The building did however require extensive modernisation including the addition of a full width lower ground and part width upper ground floor extension. The brief was simple, to bring light into the building and restore some of its former historic elegance. 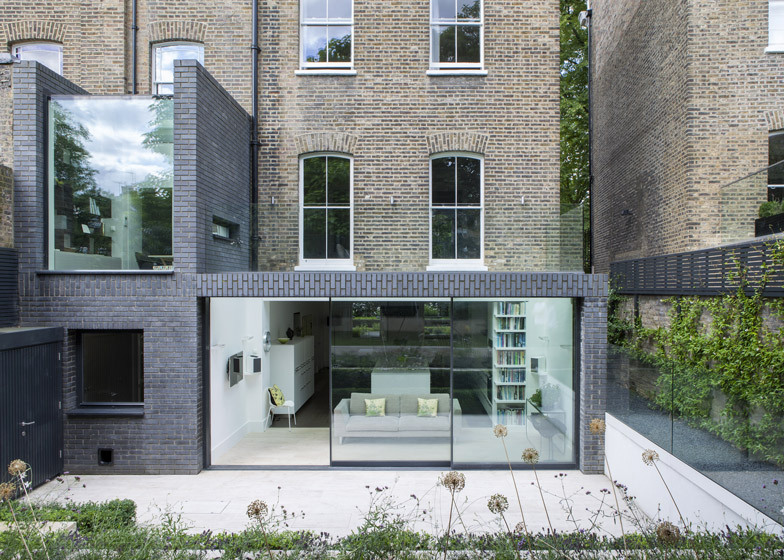 Sitting a little wider than the average similar-sized property in Islington provided the opportunity to introduce large format, thin framed sliding doors across part of the new rear extension elevation. Located above the doors is a large walk-on glass roof with access from the upper ground floor. Providing an abundance of light, the glass roof creates the connection between the upper ground floor formal living room and the less formal dining and lounge space below. The rear extension works for a number of reasons, the most visually obvious being the choice of material, the Staffordshire Slate Blue Smooth brick. We looked at a number of choices including render, which all too often stains and marks and timber, which would require regular maintenance and is prone to fade with time. We decided to present our client with the blue brick as it was an appropriate material to use in relation to the host building and providing a contrasting natural colour match to the weathered yellow stock. The slate blue brick was chosen for its colour, crisp straight edges and smooth elevation, creating a strikingly beautiful addition to the property. The elevation has been broken into distinct halves, the lower and the upper ground separated by a deep soldier course band. 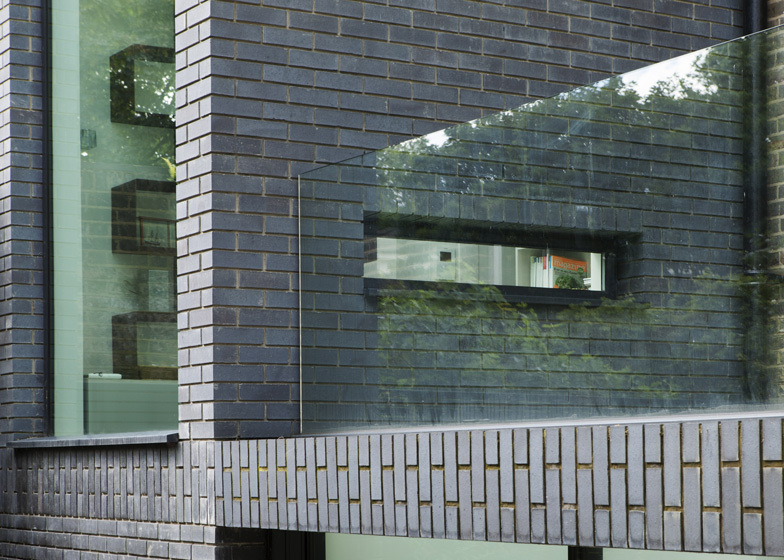 The upper floor office comprises a wrap of frameless glass to the wall and roof flanked by two monolithic brick walls framing the view to the landscaped garden beyond. 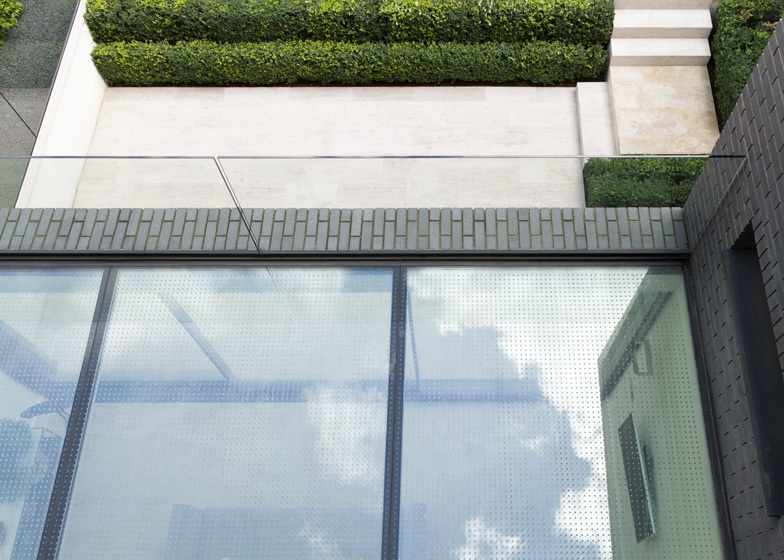 To the side, overlooking the roof terrace, sits a long thin window providing natural ventilation to the office. The continuous soldier course above the doors is formed from brick slips fixed to a GRP board fixed back to the structural steel. The underside of the lintel has been clad in the same brick concealing the lintel and reinforcing the overall affect. The brickwork has been sealed with linseed oil to provide further protection and lustre. 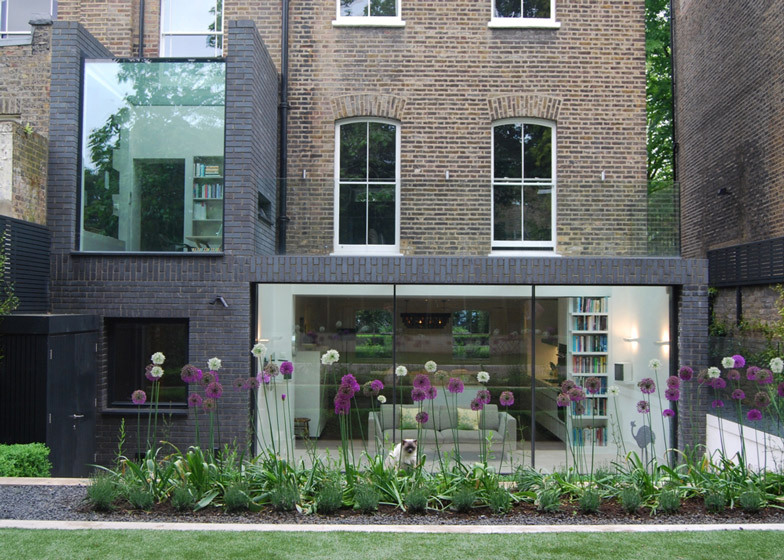 The extension has provided a wonderfully modern addition to a beautiful Victorian property and through the dark brick and subtle refined detail has helped retain much of the original character of this historic Islington building.